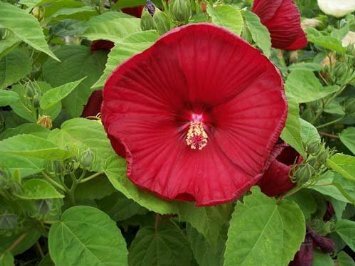 Mature Height: 24-36" Blooms: Summer to Late Summer Hardy to -20 deg F Sun Immediate shipping in 4" pot. Dormant shipping in winter. Huge flowers, extremely heat tolerant once established, large number of flowers on one plant, excellent perennial. Mature Height: 24-36". Hardy to -20 deg F. Immediate shipping in 4" pot.